ABUJA – The Peoples Democratic Party (PDP) has felicitated with President Muhammadu Buhari over the latter’s return into the country from a long medical vacation in London. In a statement issued Saturday by the National Publicity Secretary of the party, Prince Dayo Adeyeye, the PDP expressed happiness over the return, saying the President would now resume duties to pilot the affairs of the Nigerian state. “The President departed Nigeria on 7th of May, 2017 for an ailment and returned today being August 19, 2017. We believe that Mr. President is healthier now to assume his responsibility at the helm of the Country’s affairs. “We thank the Almighty for saving his life and pray that he grants him better health and understanding on how to rescue our poor economy and relieve Nigerians from the current hardship,” the statement read. 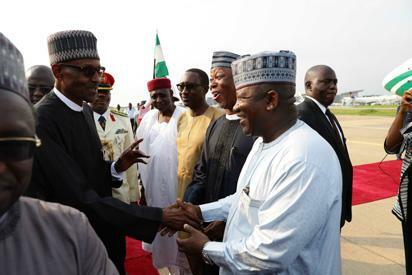 The post We believe President Buhari is healthier now – PDP appeared first on Vanguard News.